Located just outside New York City (at 1000 New County Road Secaucus, NJ 07094, (855) 999-9010), Field Station Dinosaurs is an educational and fun animatronic wonderland, set against the backdrop of the New Jersey Meadowlands and the New York City Skyline. Along with seeing (and hearing!) the amazing, life-like dinosaurs (some of them even appear to be breathing!) and learning about the prehistoric age, kids can take part in a variety of demonstrations about reptiles and other kinds of animal life. Ampitheater shows, such as: Dino Whodunnit, an exploration of what may have caused the extinction of the dinosaurs, and Dragons to Dinosaurs, an interactive show merging myth, mystery, and science! A variety of workshops and games, including: Avian Dinosaurs (an interactive show exploring the link between the birds of today and prehistoric dinosaurs) and Found in New Jersey (an exploration of the state of the state millions of years ago), among others! Dinosaurs Alive: a 3-D adventure about the latest scientific breakthroughs relating to archaeology and prehistoric research. A fossil dig site: a chance for kids to join with paleontologists to see what its like to work on a real expedition! Numerous group discussions along the trail: topics such as alien rocks, ancient energy, bone hunters, and dinosaur eating habits are discussed. 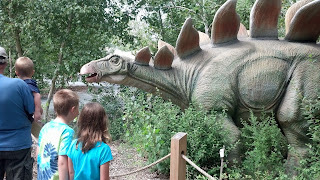 In addition, there are several fun activities along the trail, such as a dinosaur dance party and an interactive painting program entitled, What Color is Your Dinosaur? The T-Rex games: here, teams face-off for pride and prizes! Every event is a dinosaur-themed test of skill, knowledge, or sometimes, just plain luck. Bonus: if you find yourself on the winning team, your team photo will be taken for the Field Station Dinosaur Facebook page! This park truly has something for everyone! But if you're going to squeeze in a visit this year, you'll have to hurry - Field Station Dinosaurs closes for the year on November 10th! So click on over to their website and order tickets for your favorite little explorer today!